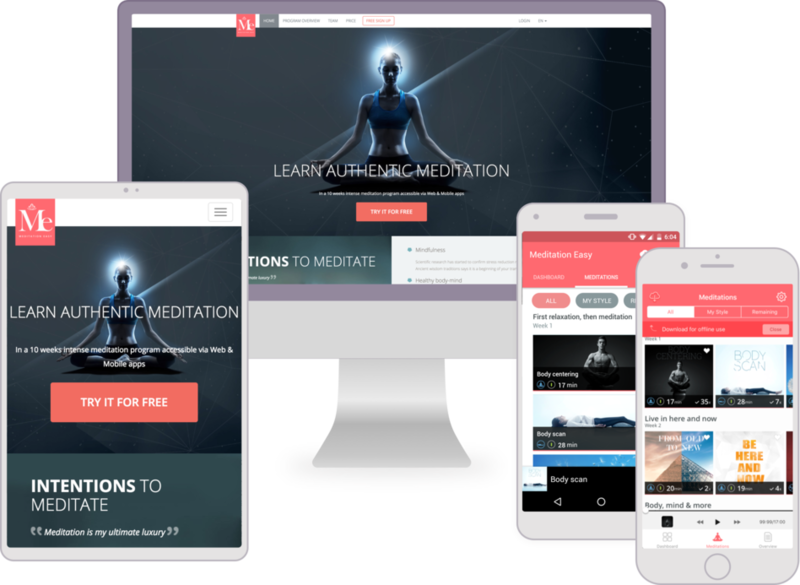 The goal was to build mobile and web applications which allow users to consume unique audio meditation content. Consistently across devices, users should be able to start their experience on the web and continue listening to it on their mobile phone. The user experience had to be lightweight and intuitive. We had to design a way how both gallery of media files and the whole program progress could be accessible without any hassle. We developed mobile applications, where the audio content is fully accessible for offline usage when downloaded. The product is monetized using in-app purchases and subscriptions. We have also designed and created a presentational website for the application equipped with powerful administration as well. The solution consists of development of native mobile apps for iOS and Android and responsive website. All three components allow consumption of the audio content. The audio content is organised into the program. User is able to see his progress as well as other statistical information as he is listening to individual audio files. We developed mobile applications and web application which allow user to consume audio content. The progress of user is tracked across all platforms and is available to the user at any time. For every audiofile, user can decide if he downloads it for fully offline usage. Applications are available for free and our client is monetizing them via in-app purchases and subscriptions. This mobile application has been carefully designed to provide great experience on all sorts of devices. The unique technical feature of this app is the ability to both stream media and to download the media content for offline usage. By default, the audio content is streamed from the server. But if the user decides to store particular audio file or the whole program for offline usage, the application will download it in a smart way. This smart downloading includes a queue mechanism which ensures that when the download of multiple files is interrupted in the middle, only files which were not downloaded are downloaded again. This saves precious time of the user and bandwidth as well. The result of development are native mobile applications for iOS and Android as well as the web application. Few audio files are available for free, for access to the whole program a subscription is required. Both the mobile applications and their web companion are introduced to users on a nice presentational website.